Pex tubing is a cross-linked polyethylene. The cross-linking process makes the tubing stronger so it is tolerant to high heat and high pressure. The pex tubing is set into the concrete slab and circulates hot water, which provides heat to the room. Pex tubing is also used in greenhouses to keep plants warm. Pex is a flexible tubing that is joined to specially made fittings using a crimping tool. It is installed in long lengths as well as short spans, but for use in radiant heating it is placed under a concrete slab in coils like a snake. Take the Pex tubing and evenly place it as coils across the ground where you will pour your slab. Run it down one length, around the corner and back up the other side. Repeat this process until the ground is covered. Stay away from the edges of the room by 6 inches. Spray an oxygen barrier on the Pex tubing to protect the heating system from getting any oxygen inside, which can cause deterioration. Place a metal hose anchor over the tubing every 12 inches. The half-circle supports have flanges on both sides that screw into the ground to hold the tubing in place. Place a metal rebar grid over the tubing. The rebar rods are placed in a way to form a checkerboard appearance over the slab area. Tie the rebar with tie wire at each intersection. Pour your concrete over the ground to create your concrete slab. Cover the tubing completely. The Pex tubing is flexible and can turn corners, but using a product called an elbow basket helps ease the tubing around sharp corners. 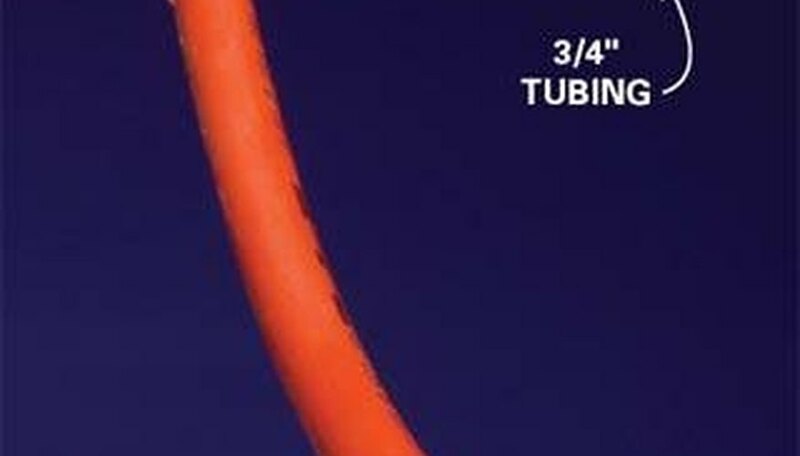 Pex tubing has not been approved for use in outdoor above-ground use. Pex tubing purportedly lasts longer than copper, but the product hasn't been around long enough to know for sure.